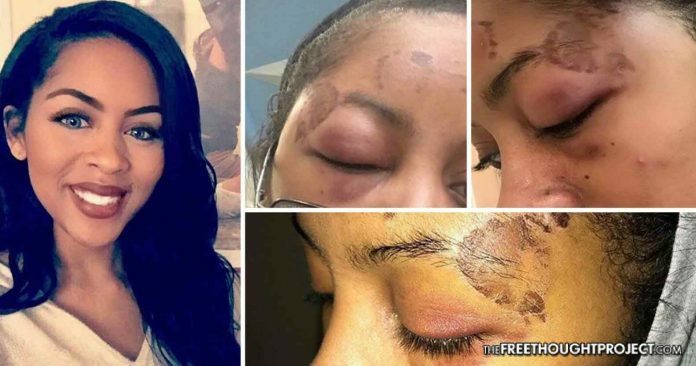 Cops in Killeen, Texas are scrambling an investigation after disturbing images were released alleging an officer severely beat a young woman. Killeen, TX — The police of Killeen, Texas are in the spotlight again after a Harker Heights Police Department officer was accused of savagely beating a woman. The gruesome photos of the aftermath have left police scrambling to come up with answers. According to a Facebook post by the alleged victim’s attorney, Leah Dure was asleep in the passenger seat of her boyfriend’s car when a Harker Heights cop dragged her from the vehicle accusing her of driving under the influence. Dure’s attorney, Lee Merritt has called for the officer he identified as Officer Wood to be fired and criminally charged for his actions against Dure. Having had a few drinks, Dure chose to stay out in the vehicle and sleep in the passenger seat while her boyfriend was treated inside. “She woke up to a white male officer dragging her from the car and banging her face into the concrete while accusing her of DUI,” Merritt explained. According to Merritt, the abuse did not stop after Dure was arrested for seemingly no reason. “She was taken to jail and was further physically assaulted by the officer she identified by his badge as Officer Wood as she tried to explain she was not driving, she doesn’t know how to drive, this was not her car,” he explained. Highlighting the sheer lack of evidence of an actual DUI, Dure was not charged with any vehicle-related charges and instead police charged her with public intoxication “in a bizarre attempt to justify her unlawful arrest,” according to Merritt. As the disturbing images of Dure began to share around on social media, both the Killeen police department and the Harker Heights department were forced to respond. The Harker Heights department’s statement made sure to remind everyone that what is shown on social media is not always the truth. Below is the original post showing the disturbing nature of Dure’s injuries. “We demand Officer Wood be terminated and criminally charged for this attack immediately,” Merritt demanded in his post. As the Free Thought Project has previously reported, only weeks ago, the Killeen department was seen on video beating a gay student by the name of J.W. who had just gotten beat up another boy by the name of Travis. When police arrived, despite being told by the bus driver Travis was the “problem child” and the instigator bully, police apprehended J.W., forcefully taking him off the bus, and then body-slamming him onto the hard ground. Only days after they were seen beating a gay high schooler, the Killeen police department was involved in a massive corruption scandal in which the son of one of their officers murdered an unarmed man in cold blood—on video—and was never arrested. The family of the victim has fought tirelessly—albeit unsuccessfully—to hold the man who killed their son accountable, but they are receiving no help from police. While we may not know the exact story of Leah Dure, given the recent history of the Killeen police department, dismissing her claims would be outright silly. Hopefully, the officer involved had on a body camera or a dashcam which caught the alleged abuse. This way, after the officers get off with a slap on the wrist, the taxpayers can then be held liable for his violent actions in the form of a lawsuit.